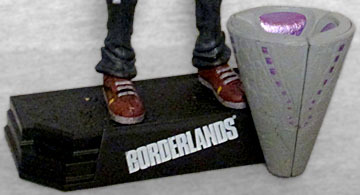 The first Borderlands was sort of a sandbox game - it had a goal ("find the Vault"), but no over-arching antagonist. Borderlands 2 fixed that by introducing Handsome Jack. After taking over the Hyperion corporation, Handsome Jack declared himself dictator of Pandora, and takes full credit for finding The Vault. Nestled in his geostationary "H-shaped" moon base, Jack can send supplies and troops down to Pandora, and most importantly can keep an eye on Vault Hunters at all times. Why is "H-shaped" in quotation marks? His moon base is literally shaped like an H. That would be like saying "Batman drives around in a 'black' car." Putting "quotes" around something makes it seem like you're "saying" it sarcastically. It'd be one thing if they were quoting the name of the base, but they're not - the base (which actually floats in the Lagrange point between the planet Pandora and its moon Elpis) is named Helios. Sorry, is named "Helios." Which may seem silly, since "Helios" means "sun" and this is a base on a moon, but in Greek mythology, Helios was the son of the Titan Hyperion. So there you go. The original idea behind Jack was that he'd just be a rival on your own level, sometimes helping you and sometimes screwing you over for his own benefit. Eventually he was elevated to a world boss, constantly pestering you from afar like GLaDOS. He's also designed to look like he'd be the star of his own game, rather than just a villain in yours. He wears sneakers, relaxed pants, and then enough layers on his torso to make a Colonial Marine jealous: starting closest to the body and working our way out, we have a yellow shirt, what appears to be a white lab coat with the sleeves rolled up, a brown vest, and a blue suit coat. Dang, Jack, take it easy; you're going to overheat! He's also got a beaded necklace, a watch with a wide band, and a tattoo all the way around his right wrist. Some kind of tube or wire runs from a clip on his vest up to his right shoulder, and a wallet chain dangles past his left hip. 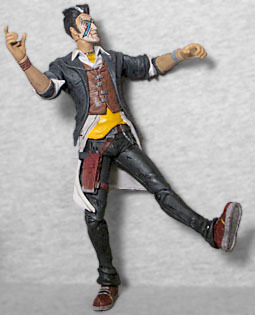 Handsome Jack gets the typical "cel shading" paint style, with black outlines for the wrinkles on his clothes and his arm hair. His colors are all very dark and heavily saturated, so that even the white coat he wears ends up more of a dingy gray. The mask he wears to protect his handsome face gets its own black outline, and silver clasps that are presumably holding it in place? The figure gets two heads: one wearing the mask, the other without. On the second head, you can see why he feels the need to conceal his face: like Moe Szyslak said about Furious George the knife-fighting monkey, "he ain't pretty no more!" There's a big blue(?) scar curving across his face and rendering one eye blank, plus several other smaller red cuts on his cheeks and chin. At first this looks like another mask, since the face is paler than the rest of the skin, but then you notice there's no outline around it, and suddenly the choice makes sense: because his face is always concealed, it never gets any sun; that's a tan line! The articulation on Jack is similar to that on Tiny Tina: there's a balljointed head, swivel/hinge shoulders and elbows, balljointed wrists, a balljointed chest, swivel waist, balljointed hips, swivel/hinge knees, and balljointed ankles. The waist is unnecessary, since the torso not only duplicates but improves the range of motion, and my figure, at least, was falling apart at the waist anyway; I had to boil the torso until it was soft enough to push the big peg into place. The hips really don't do as much as they could, and the arms won't raise very far due to the shape of his jacket, but Jack definitely isn't a pre-posed McFarlane toy. 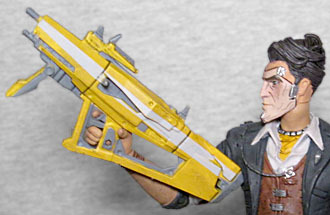 In addition to the extra head, Handsome Jack comes with the Transmurdera submachine gun, a futuristic assault rifle done in the standard yellow-and-gray colorscheme. His right hand is open to hold the gun, but apparently McToys didn't trust their own work, becase there's a peg in his palm to help hold the gun securely. He also includes the Vault Key, which looks like a big concrete pylon with metallic purple elements on it. While the key could easily have been molded as a single solid piece, it's actually made from three sections - a nice nod to the first Borderlands game! There's a display base with the game's logo on the front, and codes for some kind of in-game loot. "Handsome Jack" was originally just a placeholder name, based on Jack Harkness, but no one ever came up with anything better, so it stuck. The goal was to create a real douchebag boss, and the designers succeeded marvelously. 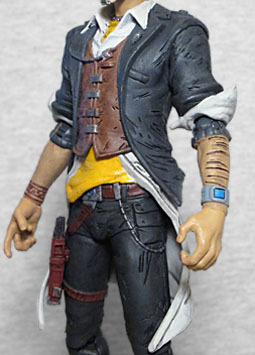 So let's hear it for McFarlane Toys, making a nice toy of him!